For more information about the National Brain Tumor Society, visit http://www.braintumor.org/. Join us at this year's event! Make a donation to the National Brain Tumor Society and select from hundreds of donated, handmade scarves, hats, mittens and more. 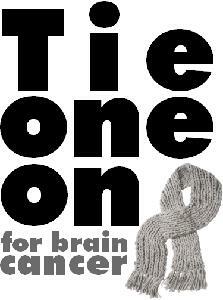 Learn more about Tie One On For Brain Cancer by visiting http://www.tieoneonforbraincancer.org or check out our page on facebook. Please join me in the fight against brain tumors by making a donation to my fundraising campaign to support the National Brain Tumor Society. I'm a brain cancer survivor. My tumor was discovered accidentally after an MRI when I was 23 years old. It was a slow growing tumor, so my doctors recommended a "watchful waiting" approach. In 2008 the tumor had grown and after a biopsy, I was diagnosed with an Oligodendroglioma. Due to the location and size of the tumor, it is inoperable. I began TomoTherapy radiation and chemotherapy in the winter of 2008. Since the discovery of my tumor, I've wanted to do something to help those diagnosed with a brain tumor and their families. Tie One On For Brain Cancer provides an opportunity for everyone to assist in the quest to fund research that focuses on new therapies for brain tumor patients and improvements to existing therapeutic options. Whether you are a knitting novice or a pro, a donator of materials, or someone who loves to shop - everyone can take part in this fundraising effort. I am the luckiest cancer patient I know. I look healthy, I feel healthy and I enjoy life. I have an incredibly supportive family and network of friends. And I'm so thankful that I have the ability to make a difference and raise awareness. Thank you for visiting this campaign and supporting the National Brain Tumor Society. Donations are tax-deductible and can be made easily and securely through this website. If you prefer to mail in your donation, you may send a check, made payable to National Brain Tumor Society to their east coast office. Please be sure to write my name/campaign name in the check memo line! This fundraising campaign has been established by a third party for the benefit of the National Brain Tumor Society (NBTS). NBTS is not responsible for the creation or maintenance of this campaign page, the actions of the campaign owner, or the activities associated with this campaign.Please join me in the fight against brain tumors by making a donation to my fundraising campaign to support the National Brain Tumor Society. This fundraising campaign has been established by a third party for the benefit of the National Brain Tumor Society (NBTS). NBTS is not responsible for the creation or maintenance of this campaign page, the actions of the campaign owner, or the activities associated with this campaign.